We love weddings in the mountains. So when Alisha and Galen reached out to us for their Vermont destination wedding we couldn’t be more excited. Although from Boston, they chose to celebrate their wedding in the Green Mountains at the Mountain Top Inn and Resort in Chittenden, Vermont. The venue sits right on a gorgeous lake and is surrounded by mountains and meadows everywhere you look. It is truly one of the most breathtaking views we’ve witnessed at a wedding. There is something so romantic and whimsical about being surrounded by the beauty of nature, especially on a wedding day. Alisha & Galen are seriously the sweetest couple and it was so obvious on their wedding day how in love they are. One of the most rewarding parts of our job is witnessing a couples’ love for one another. Alisha and Galen exchanged letters with each other on their wedding day and it was such a joy to hear each of them. Through their letters to one another, it was so clear how much these two mean to each other. It was hard not to shed a few tears. One of the most incredible parts of this wedding has to be the story behind Alisha’s wedding dress. She actually wore her mother’s wedding dress. She had it whitened and altered and oh my gosh it was seriously the sweetest thing ever. Alisha and her mom have a very special and close relationship. Alisha and her mom are so close, Alisha even made her mother her Matron of Honor… it doesn't get any cuter than that. Also, it just happened to be around her parent’s 30th wedding anniversary. What an amazing gift to her parents to wear her mother’s wedding dress almost exactly 30 after they were married. Alisha & Galen’s wedding was picture perfect. The sun set beautifully, and throughout the day there were these huge dark puffy clouds that made the sky look incredible! The Barn at the Mountain Top Inn is a perfect reception spot and was beautifully decorated with twinkle lights and candles. It really had such a romantic, cozy vibe. Galen and his mother shared one the most memorable mother/son dances we’ve seen! They seriously tore up the dance floor and had everyone else pumped up for a night full of unforgettable memories and dancing. Oh, and did I mention they had a Ben and Jerry’s ice cream cake?! How sweet is that! Watch Alisha & Galen’s wedding film at the top of this blog to truly experience their Vermont destination wedding! Jackie & Michael have the cutest love story. Their romance first started when they met at a friends pool party in the eighth grade. Yes, eighth grade! They both come from big, tightly woven families and have a large group of friends. Their bridal party was the largest we’ve ever seen, with 12 bridesmaids and 12 groomsmen! Jackie & Michael were married right on the beach at the Sea Crest Beach Hotel in Falmouth, MA. It was officiated by one of their closest friends- the host of that eighth grade pool party! It was a gorgeous summer day on the Cape. Their ceremony had the perfect amount of humor, which was a perfect representation of this easy-going, fun couple. Jackie & Michael’s reception at the Sea Crest was beautiful! The room had big windows on the side overlooking the ocean, which made for a breathtaking view of the sunset! It was a good one too! The sky lit up pink and orange and was the icing on the cake for a perfect summer, beach wedding. Through the speeches at their reception, to all the wild dancing, it was very obvious how loved this couple was given the amount of family and friends they had to celebrate with them! Nicole & Angad are from Virginia, but chose to be married on the island of Martha’s Vineyard, a place that has always had a special place in Nicole’s life and heart. Kim & Sean had a gorgeous day for their wedding celebration at the Pavilion at Pinehills Golf Club. Ashley and David are one of the most adventurous couples we know. In lieu of a traditional wedding, the couple chose an intimate elopement in one of the most unique locations ever- inside an actual (naturally-made) ice cave in none other than Iceland. Can it get any more badass than that?! And get this- Ashley is originally from Canada, and David from the other side of the world in New Zealand! These two adventurous souls met on a serendipitous 11-country Contiki trip, each booking it separately from their own countries, not knowing it would be the best decision they would ever make! The two met on the trip and were inseparable for the three week venture. By the time the trip ended these two decided that would not be the end for them- they planned to meet again and did so on New Years Eve in Australia, and the rest is history! The two decided to move in together, David relocated to Canada, and the two have been traveling the world together ever since! 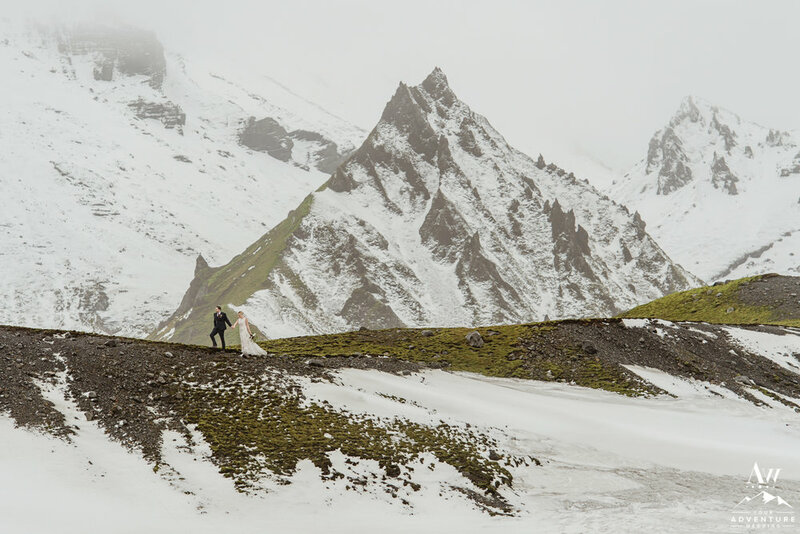 Despite having the coolest location maybe ever in the history of elopements, it was winter in Iceland and the weather was not too friendly to us that day. There was an epic storm the day before and it lingered on the day of the wedding with strong winds, rain, and snow all day. Mark and I were anticipating the worst- we couldn't fly our drone, we were afraid the hurricane force winds and precipitation would make it difficult to shoot, we didn't know if we could make it to the ice cave due to the conditions. However! We were very wrong! All we can say is thank goodness for Iceland Wedding Planner (Ann) and her awesome husband (David)! Upon our first meeting with Ann we knew it was going to be a good day. There was not one sign of fear in her eyes, you'd think it was the most perfect, beautiful day outside. To her, it was just another day in Iceland where the weather is always unpredictable and constantly changing. Ashley and David were the same way- both so excited to take on the adventure of the day. And an adventurous day it was! We traveled by SuperJeep (the only way to make it to the glacier where the ice cave lived). Let me tell you the ride in the SuperJeep was truly an adventure in itself. We had ourselves almost completely tipped over at times. 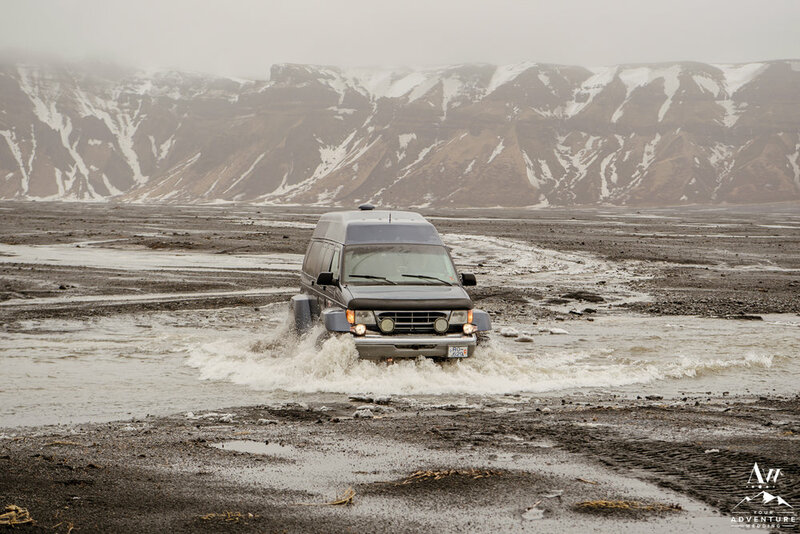 It was a bumpy, crazy drive of tilts and turns and driving through rivers. The ride to the cave was treacherous to say the least; from momentarily being stuck in over 3ft of icy slush to Mark faceplanting into said 3ft of icy slush, but oh was it so worth it! We hiked to the Ice Cave and we all carefully climbed up. We were surprised there was a new waterfall on the cave that hadn't been there the day before. The lovely couple had their intimate elopement inside, officiated by a native Icelandic pastor. It was such a unique location; one of nature's truly magical, but impermanent sights to behold! After their ceremony we took off in the SuperJeep to some other awesome offbeat spots that only Iceland Wedding Planner has access to. We first went to a huge cave where the couple enjoyed a luxury picnic complete with champagne and Icelandic hot dogs with all the fixings! Our next stop was a gorgeous waterfall, that happened to be almost completely frozen! We've never seen anything remotely like it. We enjoyed the scenery, the couple had a blast frolicking around despite the freezing temps. Our last stop of the day was a waterfall on a black sand beach. You heard me right... a waterfall on the beach! I'm not even sure how that's possible, but it was! We had to be extra careful about driving the SuperJeep on the sand so it didn't sink in. Ann's husband David is seriously a SuperJeep driver extraordinaire and got us to the waterfall safely. Ashley & David climbed up onto the waterfall and we were able to get some awesome footage of them without sinking into the quick sand! This entire day was the greatest adventure we have ever been apart of. We couldn't be more happy for Ashley and David. We know they will be reliving this day for the rest of their lives, and so will we! 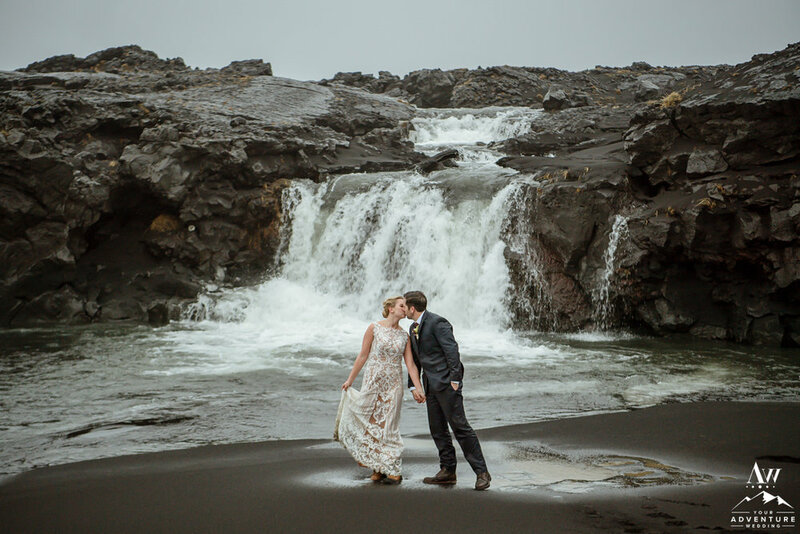 If you're interested in having an Iceland elopement please don't hesitate to contact Ann at Iceland Wedding Planner. She doubles as both a planner and terrific photographer. 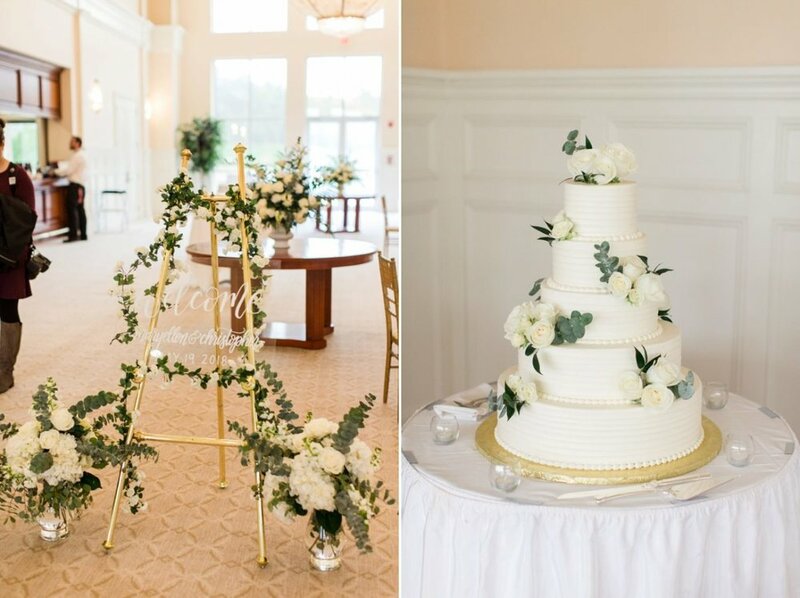 Big or small weddings and elopements, she will take care of everything from start to finish! Please read her blog about Ashley + David's day here! We're super excited to work with her and her team again in 2019! We're thrilled that one of our films is featured in Love Stories TV's new series "Real Love Stories from Around the World: United States", out now on Amazon Prime!! Becca & Russell's wedding film was one of four films selected and featured in the New England episode (Episode 4)! How cool is that?! Click here to watch the episode! Other episodes include Real Weddings in the Carolinas, Florida, California, and Hawaii! I'm sure they will be adding more locations in the future. Now you can binge watch wedding films straight from your TV through Prime Video! Learn more on Love Stories TV's blog post here! We're so excited to share this teaser from our first Adventure Wedding in ICELAND! 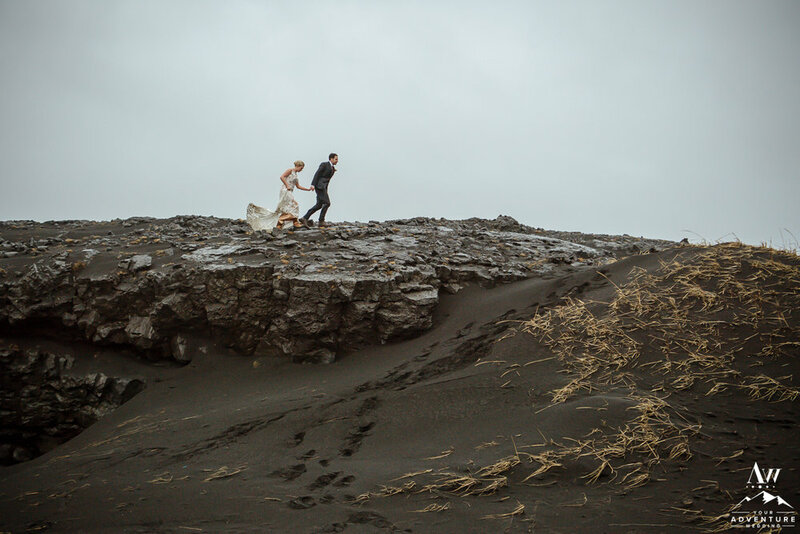 It snowed, it rained, the wind howled, and this adventuresome couple fully embraced EVERY moment of their wedding day in Iceland! It was seriously one hell of a day, with hurricane force winds at times, down pours, and some snow- but it didn't make anyone bat an eye. We crossed rivers by SuperJeep, hiked a black glacier, filmed their ceremony inside a natural ice cave, saw half-frozen waterfalls, and even a waterfall on the black sand beach (how does that even happen?!) all guided by Ann and her husband over at Iceland Wedding Planner. To say it was an adventurous day would be an understatement. Even though it was pretty chilly, the wind and rain only added to the adventure and made this the most EPIC elopement ever! If you're an adventurous couple looking for a unique and exciting way to elope, look no further than Iceland Wedding Planner!! Ann and her team made this day a true, epic experience. Ann is an amazing photographer, and an Iceland wedding planner extraordinaire! The weather is not always on your side in Iceland, but you can count on Ann to always have a plan B (and C, and D). We're excited to be a part of the Engaged! Bridal Show- the South Shore's premier bridal show! Come visit our booth and meet us on March 4th at the Red Lion Inn in Cohasset! We will be having a GIVEAWAY for $300 credit towards your wedding videography package! The credit can be used to take money off your final package, OR as a credit for select add-ons. You can use the code ENGAGED2018 for $5 off your ticket! You can buy tickets HERE. We hope to see you there! Happy wedding planning!